Fantastic competition for all you Poets of the Fall fans out there! Looks like we'll soon have HALF A MILLION likes on our humble Facebook page, and that milestone is something to celebrate! 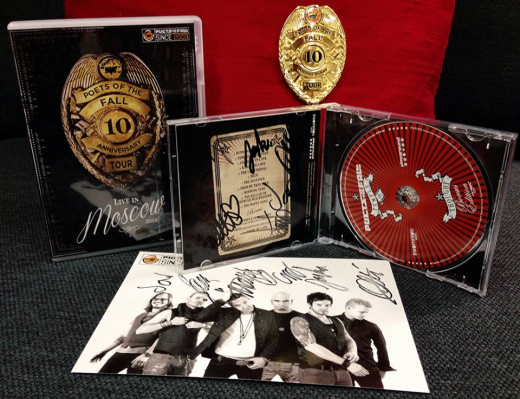 To appreciate your continuing support, we put together our Live in Moscow DVD, the 10th Anniversary Badge, and our latest album + postcard with signatures, and will give away the whole bundle to one lucky winner. All you have to do is leave a comment below* and tell us why you think we are so amazing (or just say hi). Likes & shares are also much appreciated, but of course not required to enter the competition. On Friday, February 7th 2014, we'll randomly choose a winner among the comments, and contact him/her via FB messages. The winner will be announced on our page soon after that. Thanks, and good luck! PS. Leaving more than one comment does not affect your chances to win, in either direction. * Enter the competition on the band's Facebook page. For those fans who don't know, Poets and Remedy share a close history, with individuals contributing to the original Max Payne. The band's first song, Late Goodbye, was composed for Max Payne 2. In Alan Wake they returned, this time as the in-game band, the Old Gods of Asgard. Through this name, Poets created the songs Children of the Elder God, The Poet and the Muse, and Balance Slays the Demon (the latter appearing in American Nightmare). The band also had a couple of their songs from previous albums appear in the games such as War and The Happy Song.